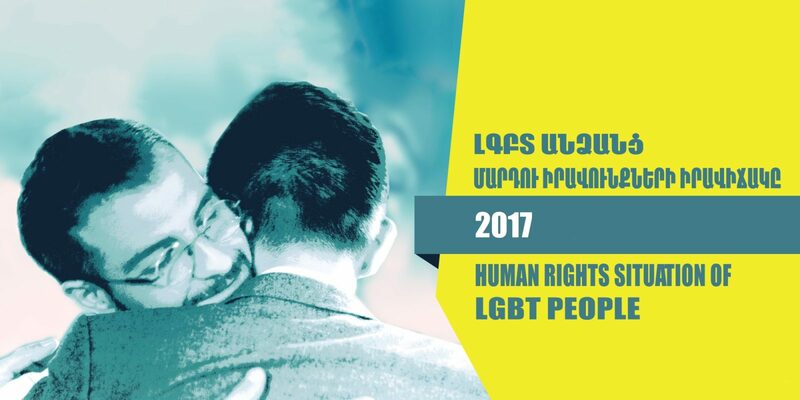 The Human Rights Situation of LGBT People in Armenia, 2017 report summarizes the cases filed to and documented by PINK Armenia, presents excerpts from interviews with LGBT persons, introduces the court cases filed in 2017 and publications from online and mass media. Key provisions of human rights protection in national and international law that have been violated or restricted in the documented cases. General description of cases involving violation of rights. In 2017, discrimination of LGBT persons and restrictions imposed upon them were poignant particularly in terms of violations of the right to freedom of expression. In May 2017, the Municipality of Yerevan instructed removal of billboards with LGBT-related PSAs. In July 2017, the Armenian Apostolic Church shepherded the removal of two LGBT-themed films from the “Golden Apricot” International Film Festival. In 2017, one person died as a result of human rights violation based on sexual orientation. In early 2017, Zourab Nemsadze, a citizen of the Russian Federation of Georgian origin, committed a suicide. Zourab Nemsadze had arrived in Armenia upon the request of his partner in order to help him out of his parents’ pressures. In 2017, the new draft Criminal Code was introduced to the public for discussions. Article 197 of the draft stipulated a ban on discrimination on the basis of sexual orientation, nonetheless omitting gender identity. During the same year, PINK Armenia documented 30 cases of violations of rights on the basis of sexual orientation and/or gender identity. These violations were accompanied by discrimination. 8 of the cases are still being processed; 14 of the cases did not receive a legal follow-up due to several reasons; 4 of the lawsuits were terminated; no criminal investigation was initiated for 2 of the cases due to non-identification of the victim. In the event of these last 2 cases, the victims did not wish to have their identities disclosed, which resulted in the avoidance of reporting their violations to the law enforcement bodies. The termination of cases occurred as a result of a mutual agreement between the victim and the offender, and the victim retracted their complaint. Another person who avoided filing a complaint against violations inflicted upon them was a mandatory conscript in military service. This was a reason for fearing to report a complaint against the actions of the military commanders with whom they had a dependency relationship. Given that the human rights violations in the army were exclusively inflicted by the command staff, no measures have so far been taken to prioritize the safety of military servants and to investigate this specific case and to bring those in charge to accountability. Amongst the cases that have not been followed up 8 are domestic violence cases. The victims did not wish to report against their family members. In these situations, the social worker of PINK Armenia got involved and provided social support both to the victim and their family members. As for the rest of the cases, the victims did not wish to follow up with reporting to the law enforcement bodies on violations of their rights as they predicted a risk of their confidential information disclosure by these bodies, in addition to their distrust towards the law enforcement system overall and doubts for the possibility of the offenders to be held accountable. In these situations, the offenders were contacted privately and the continuation of the abuses was prevented. There are 2 administrative and 6 criminal cases in legal procedures. Two of the criminal cases are still in a court trial, while a pretrial investigation of two of the other cases has been completed, but not yet sent to court. The plaintiff of both administrative cases is PINK Armenia. The cases are under pretrial court investigation. 2 persons have turned to Armenia’s Human Rights Defender’s office; 1 through a written appeal and 1 by a phone call. In both cases, the complaint was related to illegal disclosure of private information. This report is concluded with PINK Armenia’s recommendations to state institutions, mass media, international and regional organizations, the Ombudsman’s office. Implementation of these recommendations will secure a safe environment for LGBT persons in the society, where they will be full members of the society and will have an opportunity to successfully exercise their rights and freedoms.